A "starter" is another way to make bread rise. Actually, a starter is a yeast, but it's different: (1) it takes on special characteristics (ex. : sourdough); (2) some of the starter is held back to use the next time. The starter from scratch is generally made by whatever yeast is "available" in the environment. You can buy powdered sourdough starter, if you prefer, and this often produces a more consistent flavor. But making it with "wild stuff" is life-on-the-edge! The traditional way is to use the starter alone as the leavening agent, but if you like, make a yeast sponge first and add the room-temp starter to it. These recipes also call for a dose of sugar, which probably is not traditional, but I find it gives the yeast + starter mix a good sendoff and also does not change the flavor (that I can tell, anyway!). There is a newsgroup about sourdough bread if you'd like to explore the details more fully or have questions. This recipe is from a college friend, basso Len Dinkler, including his instructions for the starter, two breads, and pancakes. Bread instructions are streamlined; if you want more detail see the "Basic Premises of Bread-Making," hot linked above. Mix in a 1 1/2- to 2-qt. Glass or crockery bowl. Cover with cheesecloth to keep our foreign particles. Leave in a warm room 48 hours, stirring 2 or 3 times. Mix will ferment and smell sour. Makes 3 c starter. Store in refrigerator. To use: bring to room temperature. Stir and pour out amount needed. In another bowl, mix equal parts of flour and water (ex. : 1 c of each) and pour into starter crock. Stir. Let stand at room temp, covered with cheesecloth, until bubbling starts again. Close crock and refrigerate. Mix yeast and water and let bubble. Add sugar and starter and mix well. Stir in salt and as much flour as possible. Knead in rest. Continue to knead. Let rise 'til doubled. Punch down. Form. Let rise 'til doubled. Slash/glaze tops. Heat oven to 400 degrees. Put pan of boiling water on bottom shelf. Bake 40-50 minutes or until done and medium brown. Yield: 2 loaves. You also could add the sugar to the "starter-plus." Note also the changes in the rising times. Put starter, water, and flour in large bowl and mix well. Let stand, covered with cheesecloth for 12-36 hours. The longer this mix stands, the more sour the bread will be; remember you started with sourdough starter, so this bread is going to be more sour than the previous recipe. Try the other one first so you can gauge how long you want the starter to ferment for this bread. Work in 2 T flour (or put it with the above starter mix), 2 t salt, and 2 c (or more) flour, kneading until smooth and elastic. Let rest 10 minutes. Form loaves and let rise about 30 minutes. Bake at 400 degrees (with the water pan) until golden. Note that these pancakes have three leavening agents: starter, eggs, and soda. The starter is prepared the night before and covered with cheesecloth, as above. Mix starter with 2 c lukewarm water and 2 1/4 c flour. Whisk well so no lumps are present. Cover, as above, and let stand overnight. Mix rest of ingredients to make a batter, thinning with lukewarm water if necessary. Make silver-dollar sized pancakes, using about 1 T batter. Flip when surface bubbles form. Yield: 4 1/2 c batter or about 70 silver dollar pancakes. If you prefer or everybody is getting pretty hungry, make regular-sized pancakes! 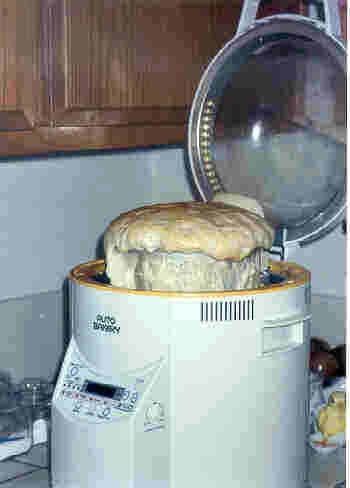 In my experience, sourdough bread is not successful in a breadmaker.